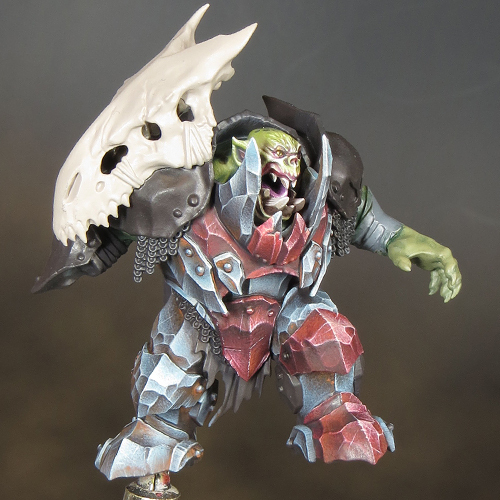 It feels like I’m dancing a foxtrot with the Megaboss … painting is going Slow-Slow-Quick-Quick-Slow! 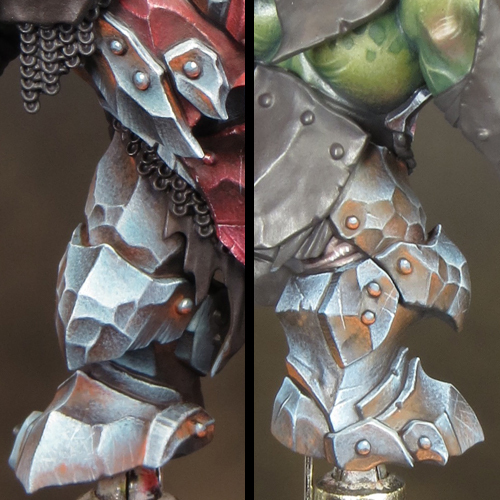 Some areas of the armour come together very easily while others take a lot of effort to resolve. However, I’m very happy with the results, so I think it’s worth the extra time and effort. There is a part of me that wants to jump ahead and start experimenting with freehand decoration, but I think a more planned approach will result in a better mini. 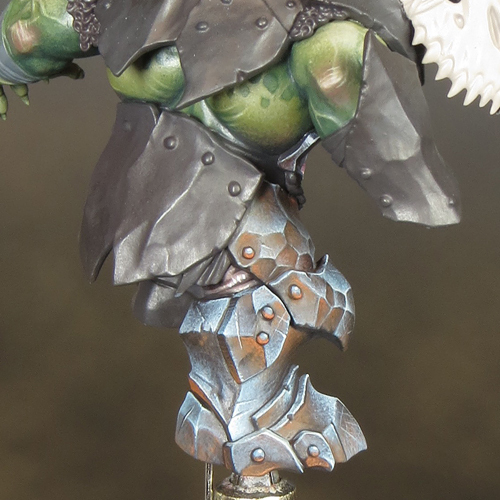 The overall colour composition will be stronger if I resolve the armour as a whole before I get stuck into the details. As I said in my last posting, the basic armour scheme is a simplified version of the one I used on my Dark Eldar Scourges. The main difference is that on the Megaboss the blue/grey colours follow a much simpler progression from dark to light. 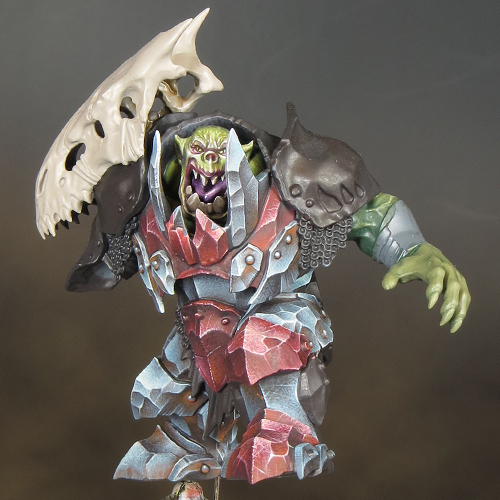 The Scourge minis had a more complex play of colours in the mid-tone range. The result of this is that the armour on the Megaboss is far less ‘pretty’ and more brutal looking than that on the Scourges. 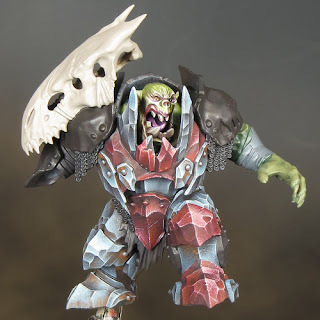 This overall impression feels appropriate to the nature of an Orruk. You can see the exact colours I’ve used in the photo above. However I’ve used more generic terms in the description below. It’s very important to think about the type and nature of the colours being used. It’s all too easy to get hung up over using a specific named paint colour and that can limit your creativity. Dark brown mixed with a little Dark blue/green to darken and desaturate it. Absolutely extraordinary - great update, thanks for sharing. Simply amazing paintjob =) Can't wait for the final results! Amazing job, can I ask what brushes you use, especially for the stippling? Windsor & Newton series 7. In the past I've used a synthetic sable mix for stippling which works very well. In the case of the Megaboss I've use series 7 in order to get a very fine stipple texture. David, just stumbled on your blog. Absolutely blown away. Top notch stuff here. Any chance you could fix the photos on the DE NMM painting tutorial? They ended up gorgeous but I can't entirely get a feel for some of the steps without some visuals. Thank you sir, and keep painting! And thank you! Hopefully the pictures are now fixed for this tutorial. Making a title/name plaque for a display plinth.